Matter is in flux. Its flows can be encountered on different scales of space and time. The characteristics of these flows influence researchers in their active and direct material engagement. 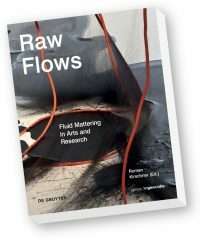 Raw Flows investigates how fluidity and flow carve their specific paths into experimental practices and thinking patterns. This book is a result of the art-based research project Liquid Things. It gathers contributions from arts, history of science, fluid dynamics, design, art history and cultural studies. The inclusion of these fields offers a diversified perspective on the material property and general phenomenon of fluidity. Within this spectrum, the book explores fluidity’s entanglement with becoming and change, asking which roles it plays in relation to the epistemic, the aesthetic and the experiential.